The New York Times: “Estimates of the death toll in clashes [Saturday] between security forces and demonstrators protesting what they called a fraudulent presidential election varied. State television said that 10 had died, while radio reports said 19 people had been killed. 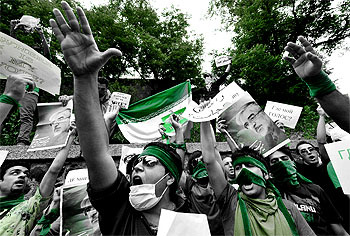 Major streets and squares of Tehran were saturated with police and Basij militia forces.